“Nihon buyo” is a type of traditional Japanese dance that has a history of nearly 400 years. It is characterized by uniquely Japanese qualities of elegance and grace. A popular workshop where you can feel free to experience “Nihon buyo” will be held from April 7, 2019 to March 29, 2020. 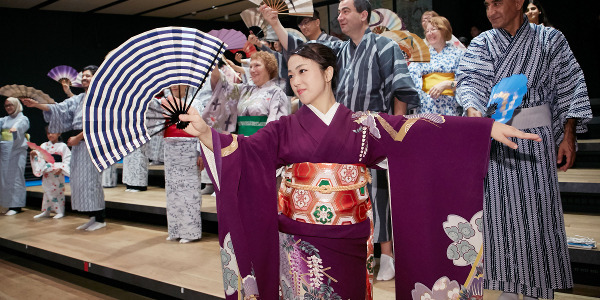 You can wear a yukata, a casual kimono, and learn how to dance in this workshop for free. In addition, it will be a valuable opportunity to enjoy the performances by professional dancers such as “Fujimusume (Wisteria Maiden)” which is the authentic and well-known Japanese dancing number. Please access the booking URL below and make an online reservation in advance. *If there is a vacancy on the day, we will accept extra participants at the venue.